Kamano: on his way to England? 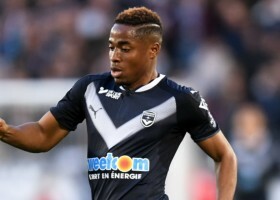 Watford has made an offer for Bordeaux attacker Francois Kamano. The highly-rated winger has so far scored 8 Ligue 1 goals this season and the Vicarage Road outfit have bid a reported 15 million euros for the player. The Guinean attacker has caught the eye so far this campaign and several Premier League scouts have been deployed to watch the attacker in action; with AS Monaco believed to be in pole position to secure a move for Kamano. However, Watford is still in the race to sign the forward and Javi Gracia has been given a healthy budget to spend on a new players this winter transfer window. Kamano, who has emerged as a top attacking talent in the absence of former Bordeaux star Malcom, has scored 22 goals in 81 games for the club and previously had a spell with fellow French side Bastia. The 5 foot 9 22-year-old has a contract until 2020 with Bordeaux and is told his agent that he wants to leave France in search of a new challenge, with his preferred destination either Spain or England. Watford has yet to sign any players during the January transfer window.